What Types of Data Will Be Overwritten in Cloning? 1. What types of data will be overwritten in cloning? For most categories, like Apps, Music, etc., data in the target device will never be overwritten after cloning – both the original data as well as new data from the source device can be kept in the target device. Please be cautious, data in the following 7 categories will be erased and replaced with data from the source device after cloning: Bookmarks, Notes, Message, Contacts, Calendar, Call History, and Photos. For example, if you choose to 1-click clone all iOS content, then only the Bookmarks, Notes, Message, Contacts, Calendar, Call History, and Photos will be overwritten, while other categories like Music, Books, Apps, etc. will keep both the original data as well as the newly cloned items in the target device. 2. In which case will data in Bookmarks, Notes, Message, Contacts, Calendar, Call History, or Photos be overwritten? 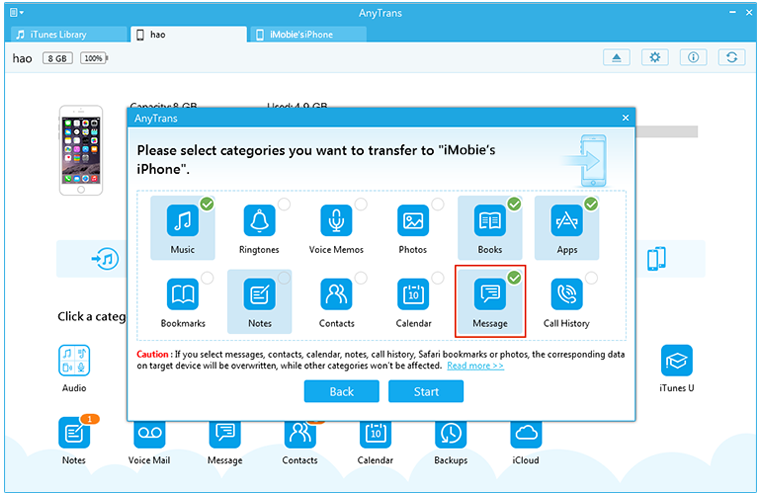 Only if you select Bookmarks, Notes, Message, Contacts, Calendar, Call History, or Photos for clone, the corresponding data in the target device will be overwritten, while other unselected categories will not be affected. 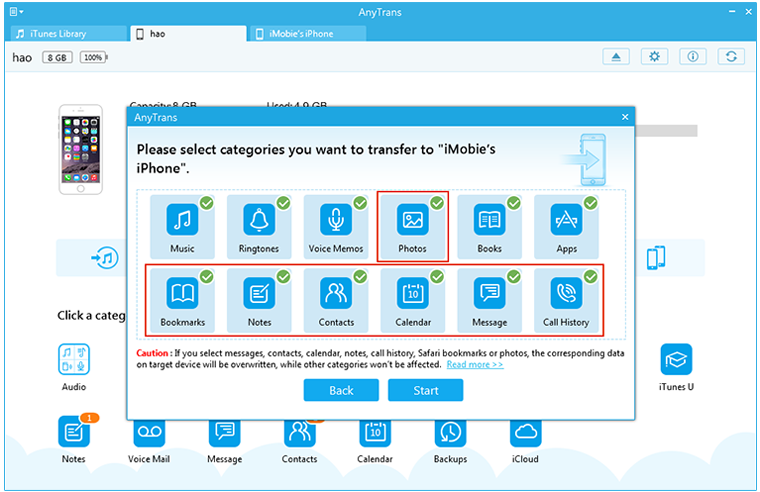 For example, if you select Music, Books, Apps, and Message to clone, then only the original messages on the target device will be overwritten, while Music, Books and Apps will not be overwritten; instead, they’ll keep both original data and cloned items. As for the other 6 unselected special categories (including Bookmarks, Notes, Contacts, Calendar, Call History, and Photos), they will stay the same as the original one.